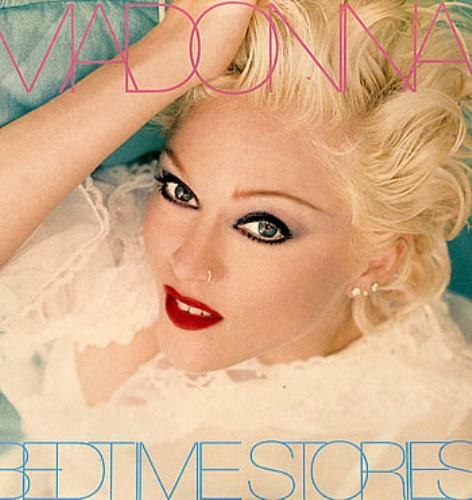 MADONNA Bedtime Stories (1994 UK 11-track vinyl LP pressed in Germany for the UK market, the sixth studio album including the singles Secret, Take a Bow, Human Nature & the fabulous title track, gatefold picture sleeve with lyric inner. The sleeve shows only a little light edgewear and the vinyl has just a couple of light hairlines, but looks barely played. A fantastic example of this 90s pressing). Related Artists: Accidental Potato Chip, Austin Powers, Blonde Ambition, Donna DeLory, Funk Freaks Vs MH, Guy Ritchie, Jellybean, Jose & Luis, Mad Donna, Mad House, MC Miker G & Deejay Sven, Me'Shell Ndegeocello, Mirage, Mirwais, Nick Kamen, Nick Scotti, Niki Haris, Out Of Your Mouth, PreMadonna, Rollergirl, Taxi Girl, Who's That Girl!